A large number of proteins that are unrelated in sequence or structure are prone to misfold into amyloid fibrils, which have a characteristic cross-β structure and are associated with a wide variety of human diseases1. Perhaps best known are the proteins that misfold in the brain, e.g. amyloid-β and tau in Alzheimer’s disease, and α-synuclein in Parkinson’s disease. However, protein fibrils can be deposited in various other organs, giving rise to systemic amyloidosis. Amyloid light chain (AL) amyloidosis is the most common of these diseases, and is caused by the clonal expansion of a plasma cell that overproduces an immunoglobulin light chain, which forms fibrils upon secretion into the extracellular space. The amyloid deposits can accumulate in different organs, with their presence in the heart giving the worst prognosis. For a long time it has been difficult to solve high-resolution structures of amyloid fibrils given that they are generally not crystalline, but this has changed with the recent advances in cryo-electron microscopy (cryo-EM). A noticeable break-through in the field of protein misfolding diseases is that we can now solve atomic resolution structures of patient-derived amyloid fibrils, as was first shown in the case of tau fibrils extracted from Alzheimer’s disease brain2. Although the precise relationship between amyloid-like protein misfolding and cellular toxicity remains to be established, these structures are expected to contribute to a better understanding of the disease process and inspire drug design. In this preprint, the first high-resolution structure of amyloid fibrils from a patient with systemic amyloidosis is reported. Light chain fibrils were isolated from heart tissue of an AL patient, and the cryo-EM structure was solved at 4.0 Åresolution. First however, the composition of the fibrils was assessed, and the authors identified a mixture of different lengths of the light chain, ranging from the full-length protein to just the variable domain, VL. Limited proteolysis showed that the VLdomain was protected against degradation, suggesting that it formed the fibril core, whereas the C-terminal parts were efficiently degraded by the protease. A previous study on patient-derived light chain fibrils at lower resolution showed that the fibrils were polymorphic3, i.e. existing in distinct structural forms, but in this case only one type of structure was identified on the EM grids. The cryo-EM map revealed a density which at first sight looks like a symmetric dimer of protofibrils. However, the authors show that this is not the case, and in fact the fibril is built up from asymmetric layers composed of a single protein monomer. Two regions of the VL domain could be fitted in the density as curved β-strand segments, leaving a large part of less defined density open. This could potentially arise from disordered protein segments surrounding the fibril core, similar to the “fuzzy coat” around the core of the brain-derived tau fibrils2. However, given that the VL domain was resistant to proteolytic digestion, the region connecting the two fitted segments is likely to be ordered, yet heterogeneous in conformation. The other, larger portion of density that could not be fitted might be occupied by C-terminal extensions of the protein, corresponding to the longer protein fragments that were shown to be present in the fibrils in addition to the VL domain only. a) Light chain fibrils extracted from the AL patient’s heart tissue on the EM grid. b) Cross-sectional cryo-EM map sharpened at 4.0 Å (blue) and unsharpened at 4.5 Å (grey). c) Part of the VL sequence modelled into the density. d) Ribbon representation of four stacked layers of the fibril core showing the β-strand segments. Adapted from the preprint under a CC-BY 4.0 International license. One of the key questions in the field of AL amyloidosis is how the light chain sequence correlates with its aggregation propensity. Normally, a library of light chain variants that can recognise specific antigens is created by genetic shuffling of the domains followed by somatic hypermutation. In AL amyloidosis patients, however, one particular light chain variant is overproduced by monoclonal plasma cells, which has raised the question if these sequences are more prone to amyloid formation than regular light chains. At the same time, one might wonder how the different sequences from individual patients could accommodate a similar fibril fold. The structure reported here shows that some of the particularly variable regions are embedded in the fibril core and contribute to the β-strand segments, but the residues that are critical for the structural contacts appeared largely conserved when a panel of disease-associated light chain sequences was compared. Light chains from different AL patients could thus form amyloid fibrils with similar characteristics as the structure here described, although it remains to be determined whether sequence-related changes in morphology may occur. I have always been fascinated by amyloid fibrils, as they appear to represent a universal fold that virtually any polypeptide can adopt, and they are a hallmark of a large number of diseases although the mechanisms linking protein aggregation to toxicity are still poorly understood. Also, these fibrils are such beautiful structures! The first structural models of fibrils formed by short peptides and yeast prion proteins appeared during my studies in biochemistry, and really sparked my interest in the field of protein misfolding. It is very exciting to see that the revolution in cryo-EM now allows scientists to solve fibril structures directly from human material. After recent work on brain-derived tau fibrils2,4,5, this preprint shows the first high-resolution structure of fibrils from an amyloidosis patient. I find the large region of density that could not be modelled somewhat unsatisfying, but at the same time it is a good example of the fact that amyloid fibrils are not necessarily uniform and rigid, but may have dynamic or heterogeneous regions protruding from their core, which could be important with respect to cellular interactions and toxicity. The authors suggest that some of the less-defined density could be occupied by the part of the VL domain connecting the two modelled regions, whereas the other, larger region could arise from C-terminal extensions. I am wondering if the authors consider it worthwhile to confirm this by obtaining the cryo-EM map of the fibrils after limited proteolysis, which they showed removes the C-terminal parts but leaves the VL domain intact. Furthermore, can the authors speculate whether the C-terminal domain may retain its native fold in the context of the fibrils, or C-terminal regions may participate in fibril formation by adopting a cross-β structure? If they were completely unfolded and extended away from the core, they would probably not give rise to any density in the cryo-EM map. Finally, I am looking forward to more fibril structures being solved from AL patients with different light chain variants, which will be necessary to better understand the effect of the amino acid sequence on fibril structure and polymorphism. Annamalai, K. et al. Common Fibril Structures Imply Systemically Conserved Protein Misfolding Pathways In Vivo. Angew. 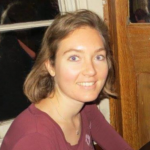 Chemie – Int. Ed. 56, 7510–7514 (2017). The authors suggest that some of the less-defined density could be occupied by the part of the VL domain connecting the two modelled regions, whereas the other, larger region could arise from C-terminal extensions. 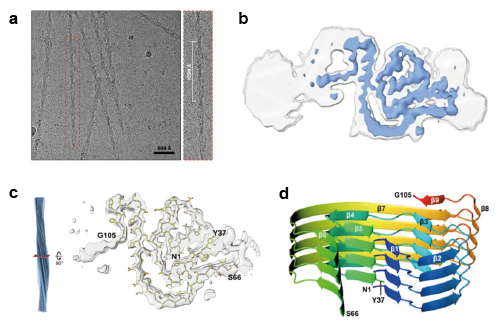 I am wondering if the authors consider it worthwhile to confirm this by obtaining the cryo-EM map of the fibrils after limited proteolysis, which they showed removes the C-terminal parts but leaves the VL domain intact. It is an interesting issue and it is a general observation: indeed many of the recent Cryo-EM papers on amyloids show that there are low order regions which likely accomodate stretches of the polypeptide not visible in the highly rigid fibrillar core. We performed limited proteolysis on our fibrils and analyzed them by western blot (supplementary fig. 1) and it is evident that the fraction of full length LCs present before the proteolysis has disappeared but the shorter fragments are untouched. We did not try to analyze these fibrils further because has reported by Fitzpatrick et al proteolysis greatly destabilizes fibrils. Furthermore, can the authors speculate whether the C-terminal domain may retain its native fold in the context of the fibrils, or C-terminal regions may participate in fibril formation by adopting a cross-β structure? We cannot say anything for sure but we may speculate. If the Cl domain had a regular conformation identical in each subunit (being native or cross-beta) we should have been able to have a sharper density. The fact that this is not the case suggests that the Cl must be there but in low order conformation(s). Given that the Vl domain has changed completely its tertiary structure, it is reasonable to think that the Cl may have also lost its native beta-sandwich structure. Moreover the mass spectrometry show that a significant partof the LC molecules forming the fibrils present an incomplete Cl domain (fig. 1) (most common cleaved LC proteoforms are 130 or 150 long, the full length is 215 residues). It is noteworthy that in literature dealing with AL amyloidosis, it is still under debate whether proteolysis precedes (and facilitates) amyloid deposition or, conversely, if unfolded or partially unfolded Cl is proteolyzed after amyloids have formed. If they were completely unfolded and extended away from the core, they would probably not give rise to any density in the cryo-EM map. Highly correct, hence the most likely hypothesis is that such stretches assume low ordered conformations but are not totally unfolded. Likely they also establish several interactions with the structured core, but are not capable to form a highly ordered cross-beta structure. Importantly in the two low-order regions not visible in the structure – the Vl region and the N-terminal segment of Cl domain – there are several residues which are unfit for cross-beta arrangement: Gly, Pro and charged residues. The analysis we carried out on the sequence of several amyloidogenic LCs shows that the fibrillar structure we determined is compatible with several other LCs sequences. However, only more experimental structures will ultimately elucidate this.